If your first thought upon hearing the word fruitcake is picturing a dry lump of disappointment brought to the family holiday buffet by your great aunt Bertha, you’re not alone. But—and bear with me here—what if fruitcake isn’t getting the respect it deserves? Did you know fruitcake was flown to the moon with Apollo 11 astronauts Neil Armstrong and Buzz Aldrin? Or that the U.S. military developed a vitamin-fortified fruitcake during the 70s and 80s as a nutrient-rich food for troops? Rare and gourmet fruitcakes can also be seriously profitable. A 27-year-old slice from Princess Diana and Prince Charles’ wedding sold for more than $6,000. Prince William and Kate Middleton topped that: a four-year-old slice of fruitcake from their 2011 nuptials sold for a whopping $7,500 in 2015. Beyond the royal table, multi-tiered creations resembling stained glass can sell for hundreds of dollars in the world’s top bakeries. It is kind of surprising one little cake has done so much. In fact, I’d venture to say fruitcake is pretty badass. So why is the one taking up space on your holiday table so very, very terrible? The fruitcake most know today barely resembles the original. Fruitcakes were once considered a luxury because the ingredients—exotic fruits, spices, nuts, and alcohol—were expensive and hard to come by. (This may explain its longstanding place as the dessert of choice for British royal weddings.) Dense and decadent, it was hailed across cultures and continents as a nutrient-packed treat that also helped preserve the season’s harvest. You see: not only is the fruitcake a dessert deserving of our respect, making one is a true labor of love. A good one takes months to prepare. Fruit should be candied for days, weeks, or even months before baking, and no respectable baker sells or serves a freshly baked fruitcake. Like a fine wine, fruitcakes require time. But mass production simply doesn’t suit the fruitcake. Without the loving care of slowly candied fruits and proper aging, fruitcake simply becomes that dense log of sugar you dread every year. Thankfully, some artisan food producers are rejecting the overly candied, cling-wrapped grocery store model and going back to the centuries-old traditional way of baking. Deep in the Missouri Ozarks, a group of Trappist monks support themselves by baking fruitcakes year-round. Founded in the 1950s, Assumption Abbey tried several other business models—cattle ranching, growing grapes for wine production, making concrete blocks using rock from a nearby creek—before switching to fruitcake production in 1987. “We bake six days a week—126 cakes a day,” says Michael Hampton, business manager at Assumption Abbey. “That’s about 32,000 two-pound cakes per year.” That may seem like a lot, but compared to titan fruitcake operations like Claxton (the Georgia-based classic you probably remember not-so-fondly from your childhood) which produces up to 4 million pounds per year, the Abbey’s output is a drop in the bucket. 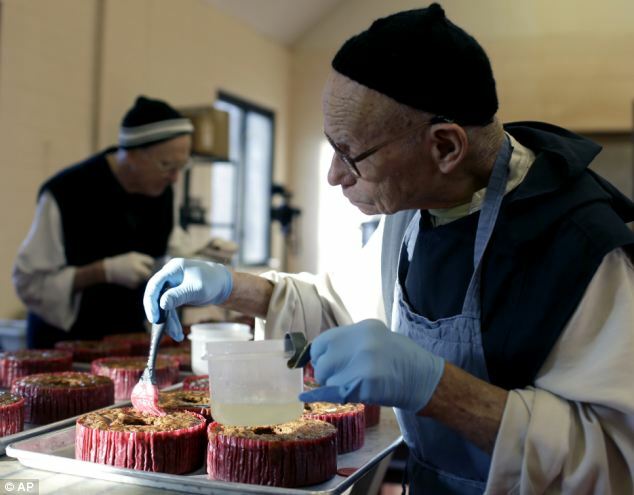 The monks’ preparation process takes two weeks. First, the monks marinate cherries, pineapple, currants, black and gold raisins, lemon peel, and orange peel in a vat with Burgundy wine. On baking day, the fruit gets mixed with batter and spices using a recipe from Jean-Pierre Augé, a friend of the abbey and former private chef for a bevy of British royals. 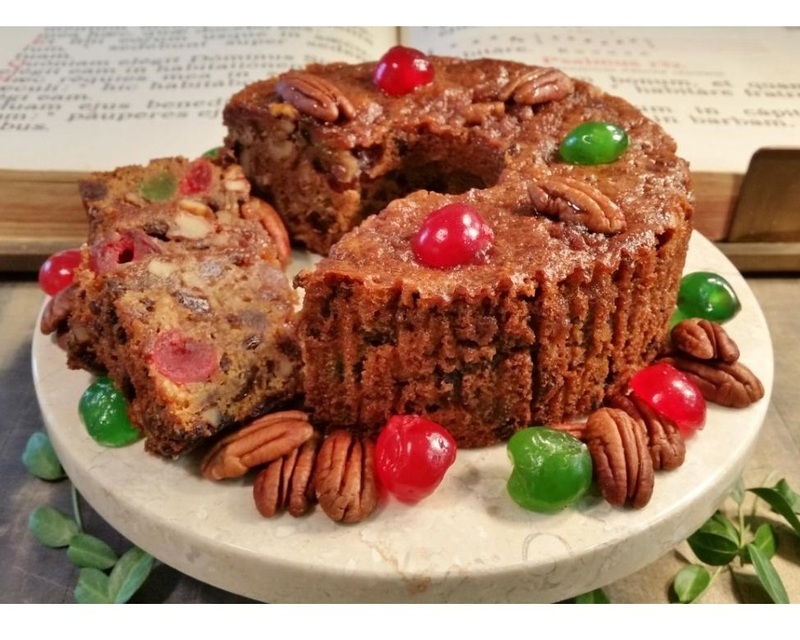 After resting for a full day, the fruitcakes are decorated with cherries and pecans, then injected with about an ounce of rum—just enough to add flavor and help preserve the cake. The monks say a prayer over every batch of finished confections, which are then set on shelves to age for a minimum of two months. “We won’t sell a fresh cake—just like a fine wine or cheese, it has to age,” Hampton says. “If you taste a new cake, you might taste individual flavors and a strong alcohol flavor, but after a couple of months, the alcohol mellows and individual flavors meld into one,” he says. If Assumption Abbey fruitcakes are crafted for the masses (or at least for like-minded foodies in search of tastier holiday pastures), perhaps the most exquisite—and rare—of American fruitcakes comes from beloved food artisan Robert Lambert, who harvests and candies his own fruit, nuts, and spices. If you think you don’t like fruitcake, one bite of his labor-intensive, one-of-a-kind creations will change your mind. His cakes take nearly a year to prepare. Lambert offers three versions of his renowned fruitcakes—white, dark, and winter—that start at $65 a pound. Each one features exotic fruits such as white grapefruit, blood orange, figs, dates, glacè cherries, and coconut. After baking, cakes (and the cheesecloth they are wrapped in) are soaked in either French cognac or whiskey. “This improves the flavor and scent of the cake when you open it,” Lambert says. 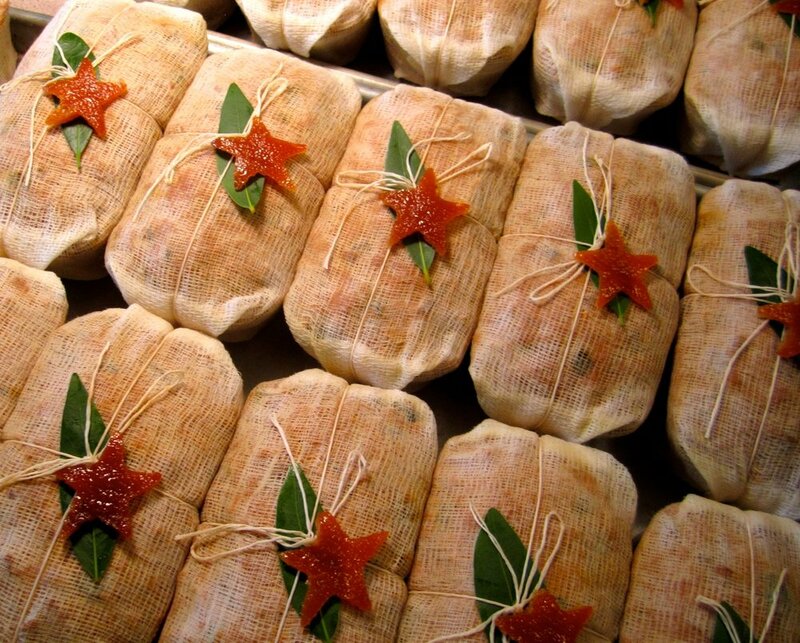 The finishing touch: a candied fruit star and California bay leaf lovingly tied with twine and placed on top. Several years ago, one of Lambert’s wholesale clients attempted to sell a few extra cakes online after the holidays, which didn’t sit well with this gifted culinarian. “My cakes are like Tiffany—they don’t go on sale,” he quips. Instead of letting his beloved fruitcakes sell below market price, Lambert bought them back and sold them the following year. “My other wholesale customers liked the idea and the way they tasted, so they started buying them a year ahead of time in order to sell year-old cakes,” he says. Now, he holds back a certain number of the 1,600 fruitcakes he makes each year for aging and offers two-year-old fruitcakes for sale as well. Lambert says that as he approaches semi-retirement, he’s working ahead to put aside more cakes for aging—some as much as six years. “I can command a premium for them because the cost of refrigeration is a factor,” he explains. So while there may be some truth to the holiday tradition of passing around the same fruitcake—or at least feeling like we are—maybe that wouldn’t be so bad if we were buying it from the right places and getting artisan-quality cake the way its original creators intended. Mass production may work for plastic Christmas trees and shatter-proof filler ornaments, but some things are worth going back to our roots for, and fruitcake might be one of them. Davina van Buren is a freelance multimedia journalist, digital nomad and adventure junkie. When she is not chasing byline glory in the travel and food realms, she's writing white papers and sales copy to actually pay the bills.